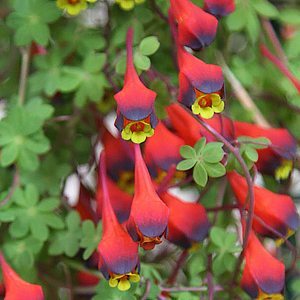 Hardly ever seen offered for sale, Tropaeolum tricolorum (tricolor) is one of the prettiest little spring flowering plants. It may have small flowers, however it does have lots of them and they are fascinating. Small trumpet shaped flowers red and purple with a pale lime green to yellow lip. Sometimes called the ‘Bolivian Nasturtium’ and yes they are related to the common garden type. These are a a climbing plant, that grow from small tubers. We grow them in a terracotta pot with a climbing frame attached. You could plant them out into the garden where they will scramble through other plants, however as the flowers are so fascinating we do like to have them on show. One of the main tricks to growing this wonderful little plant is to make sure it gets a dry summer. We put the pots away under cover when the plants have died back. Any cool dry position will do, ours are in the potting shed. Plant out the tubers in late summer to autumn use a large pot, they can reach 3m in height. 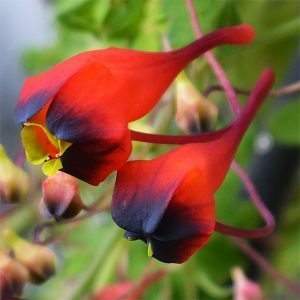 You will need a climbing frame, and Tropaeolum tricolor looks best when 3 or 4 tubers are planted in the one container. These are a fast growing species, they will break the surface and quickly climb up the trellis. Masses of flowers and then they will suddenly die back. However provided the container is well drained and kept in a cool position they will pop up again the next autumn. This is also the time to divide the tubers which will happily multiply. Every 2 – 3 years as a rule. As soon as winter comes around its time to get them out, make sure they receive moisture but are also well drained. A position in full winter sun works well. By the time the heat of summer comes around, Tropaeolum tricolorum will have died back and be ready for its summer rest. Some gardeners lift the tubers every summer, we tend to just put the pots away. You might be able to find some seed, probably from the UK. But a warning, these plants are very slow, and a little difficult to germinate from seed, so be patient and don’t be surprised if you need to have a few try’s before you succeed. You might also try Stephan Ryan at Mt Macedon if you are passing.